Purple Power grow into a glorious adult plant, but this strain is much more than just a pretty bunch of leaves. It offers great medical benefits and a taste which is a delicious mix of skunk and fruit. With about 19% to 22% THC, Purple Power acts quickly to relieve pain and negative emotional states. It does this without ever reaching the point where the average person is likely to find it overwhelming. The balance of Indica and Sativa genetics in Purple Power, moderates both the THC level and the CBD level. This Means that your experience will end not so much in a stone, but still comfortable and very relaxing. 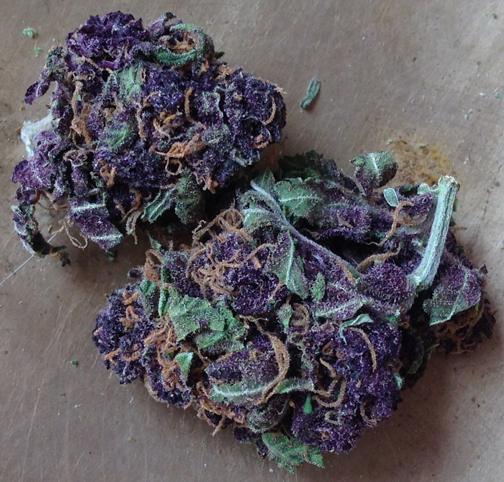 Purple Power isoften recommended to people looking for a daytime strain. But it wouldn’t be out of the question to use this strain in the evening. The Sativa genetics in Purple Power mean that they grow into tall plants. Indoors, they can easily reach 1.8M in height and outdoors they can push their way up to 2.2M. This means there is plenty of space for buds. Which is why indoor growers can expect up to 700g/m2. Outdoors growers can expect up to 1kg of buds. It takes time for your Purple Power to grow into big and strong plant with so much bountiful bud. In fact, it takes about 10 to 12 weeks of flowering indoor. Outdoors you’ll be collecting your harvest around the start of October. This means that if you live outside of the Mediterranean basin, you will really need to treat Purple Power as an indoor strain. On the plus side, this means you have the option to use hydroponics to take a week or so off this lengthy grow time. One of the big advantages of Purple Power as compared to many other Sativas is that the fact that it’s packed full of landrace genetics. It has a lot of inbuilt resistance to mould, diseases and pests. However, there is a difference between resistant and invulnerable. So you’re still going to have to pay attention to your marijuana-growing basics such as ventilation. We’ve classed Purple Power as a moderately difficult grow for two reasons. Firstly, it’s a photoperiod strain, so you must manage light cycles. Secondly, it’s a tall plant and as so needs to be managed appropriately. Indoors, for example, you’re probably going to be looking at using plant training. This is to make sure that the light can reach all the bud sites. Indoors and outdoors, you’re going to need to be ready to feed a hearty appetite. The key flavours in Power Plant are citrus lemon sweetness and skunk depth. You might also pick up notes of candy and berry. The aroma is similar, balancing lemon freshness with a skunk baseline. There’s a touch of spiciness in both the flavour and the aroma. Which tallies with the Haze parentage, but it’s more in the line of a gentle kiss than the typical Haze bite. Purple Power is quite simply, one of the most attractive strains around. It takes its name from its purple buds. The nugs are less dense than with some other strains, so you could probably use your fingers to grind them if you really wanted to. In short, a bag of Purple Power is almost too pretty to use, but then again, it would be such a shame not to.